The term “black swan” refers to the shocking discovery that not all swans are white, something the world was sure about until new data came in. Now it’s used for big, bad surprises, like discovering that playing fast and loose with marginal loans and generating huge annual returns on investments couldn’t go on forever and would lead us into a recession. We all have black swans in our lives, but we can change the way we deal with them so they aren’t constantly causing stress. I had the data. I chose not to act on it, and now I have the audacity to claim misfortune? If my Knower/Judger rules of life tell me that being unlucky is comfortable, then I might even get some emotional satisfaction out of proving to the rest of the world how unbelievably unlucky I can be. See? I’m right! If it weren’t for bad luck, I’d have no luck at all. If I choose to allow this K/J rule to live in my head, then I spend my life looking at the black swans, counting my curses. Some stuff happens at the opposite end of the luck continuum, too. We all experience incredible fortune. And we may not expect that either. We ignore the data and end up dumbfounded at our windfall. If we are always present, absorbing all the data in Learner/Researcher mode, then neither a “gotcha” nor a windfall comes as a surprise. But most of us are not that attuned to what’s going on around us. Our K/Js automatically guide us through the day, and we experience these unexplained blessings or curses. So the question becomes, which ones do we count? I’ve chosen to focus less on the black swan events and remember to celebrate the parking spot that appears right in front of the restaurant. I celebrate the miracle of my three-months-premature granddaughter, who just turned three. I celebrate the one totally successful golf shot among the 100 other black swan shots. I’m just sayin’…I’m not present all the time and am therefore unable to perceive all data all the time. 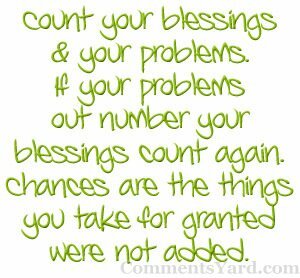 But I’ve experienced life getting better when I’m counting the blessings and not the curses.